Burst mains left hundreds of residents in Liverpool and an area of Lancashire without water on Christmas Day. In Orrell Park the supply was cut between 0830 GMT and 1430 GMT because of a frozen valve. A water main burst in Fazakerley, leaving homes without water for three hours. 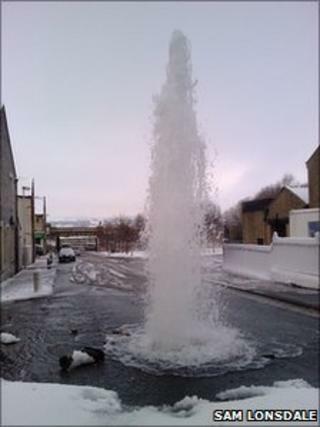 Water cascaded out of a hydrant pipe in Nelson, Lancashire, cutting off supplies between 1100 GMT and 2300 GMT. United Utilities has apologised. The water firm could not give the exact figures of how many people were affected. Sam Lonsdale, of west Nelson, said: "I was not affected but one of my relatives said he had to drive several miles to his brother's house to get some water so he could cook Christmas dinner - he still had to steam rather than boil the vegetables." United Utilities said it was most likely down to the exceptionally cold weather and apologised for any inconvenience. A spokesman said engineers were also at a burst main in Victoria Road but water supplies had not been cut off.